If you feel like you keep going to conferences and events but don’t have time to apply what you learned when you get back to the office, you’re not alone. Once you’re back and the emails pile up, the phone rings, and people walk into your office there’s not much you can do. All the good intentions you had of applying what you learned when you were out end up being nothing but notes in a drawer. If you really want to make the most out of your trade show, conference, or other learning event you attended, you have to be prepared to act when you get back to the office. And the best way is to use a systematic approach to attending conferences. I know, it sounds like work but unless you are prepared to approach it as a project, you won’t be able to really take adavantage of the learning experience after the event is over. The most important part of note taking is the “action items” block. The easiest is to just put down bullet points of what you or your team will do once you get back. Could be as simple as “Review our home page meta tags to improve SEO” or a bit more complex like “Create a project to select a CMS system for our website”. 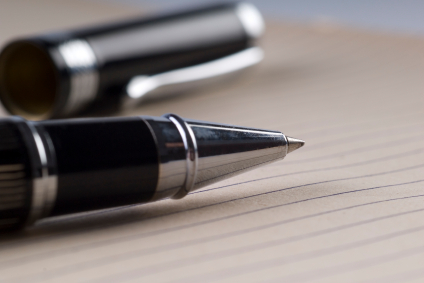 The objective is to write short, very direct items that you will later translate into more details to your team. As you take notes of each session, an interesting thing will happen. You will suddenly realize not all sessions are really good. If you walk out of a session with a blank page (i.e. no insights or action items) then you know it was just a waste of time. If most sessions end up with blank pages, then that’s a conference you shouldn’t attend next time around. Before you leave to the conference there’s two things you need to do. One, is schedule a 30 minutes meeting with your team for the very first day when you arrive back in the office. The second is schedule a one hour slot for yourself either on the very first day or the very next day when you get back. When you return, you already have a meeting scheduled with your team. Is 30 minutes long, so all those emails and fires can wait 30 mins for you to brief the team. That’s right, you’ll use that time to talk to them about the conference, the good, the bad, etc. And you will also show them your notes and give them an overview of what you’ve learned and what’s coming (action items) to each of them. This serves two purposes. First, with the conference still fresh in your mind you can accurately tell your staff what happened at the show and prepare them for what’s going to come their way, and second it helps you solidify what you learned during the show. When you get to the second meeting you scheduled prior to leaving the office for that conference, you will then stop whatever you are doing and get all your notes out. Since all of them have an “action items” section at the bottom you can quickly go through your list and start identifying what needs to get done, prioritizing the tasks, and assigning them to appropriate team members (or to yourself). I think you should also create one ‘master list’ of action items (add the conference name and date to the top) and save it somewhere you can find. If you need to refer back to the list or after 1 year don’t remember how good the conference was, just look at the list. If this process works for you, it is a good idea to show your team what you’ve done. Next time anyone from your group attends a conference or event that’s worth sharing with the team, it will be easier and more productive. As you go through your notes and action-items you are also deciding if this is an event you should go again next time around. In a recent article for the CMO Council’s Newsletter, Nicolas Watkis argues “Marketers won’t succeed if they don’t have objectives”. Right on, my friend! As we have all heard before, marketers are now more than in any other time being measured and challenged to produce measurable results. Mr. Watkis then states “the most important activities for marketers are the establishment of marketing objectives, a plan for their achievement, a budget to support the plan, and the management of assets and resources to achieve the objectives”. 1. Set measurable objectives, both financial and marketing. The financial objectives are revenue, profits, return on assets (how much sales will the campaign generate? Is a valid question to answer in your objective) and although he doesn’t describe what the “marketing objectives” are, I would focus on lead generation numbers (how many qualified leads, for example) although other metrics such as “number of blog posts” or “twitter messages” could be valid objectives for social media campaigns. 2. 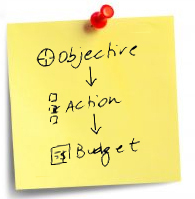 List actions to be take for each objective, with completion dates, people responsible for each action and also think in terms of alternative actions (what to do in case the action is not successful). This last bit is important for factors outside your influence, maybe a contract that depends on another company has to be signed for the joint marketing campaign to start, or what to do if certain assumptions you’ve made when putting together the plan fail to materialize (i.e. what to do if mommy bloggers don’t pick up our story or offer right away as we hope they will do). 3. Profit and loss projection with a detailed marketing budget showing the allocation of resources. So here it is, the marketing budget, the final component of the marketing plan. The meeting is over. Now what? What do you do when the meeting is over? The best way to turn meetings (which are, unfortunately, inevitable) into productive time spent with the team, is to take effective notes. During note taking I try to write only key pieces of information (and not to simply transcribe what was said) and place symbols next to each one that helps me easily and quickly identify what is important. The letter “i” in a circle: Informational only. Something that was told to give context, specific background information or other piece of data that I don’t have to do anything about. An empty square [ ] (empty checkbox): Action item assigned to me. An exclamation point “!”: Important information or decision made that I have to remember or that affects an action item. Someone’s initials: Action item assigned to someone else. “FUP”: something I need to follow up on. Usually a task assigned to someone in my team that I need to check the status. These are the most commonly used symbols during my note taking, and sometimes I add a couple more (asterisk, pointing arrow, circles, etc.) depending on the note. The key for me is to be able to review my notes and act on what needs to be done. When I have to create meeting minutes, this system helps me to go through my notes quickly and identify things that should be in the minutes versus superfluous stuff. For the action items assigned to me, the first thing I do when I get back to my desk is open my Outlook and create Tasks for each one. This way I capture all my to-do items quickly and am ready for the next item on my agenda (usually another meeting). Since I use a tablet PC (currently an HP Pavillion Tx2500), my notes are electronic and I can easily go back to them and search for them. Below is a sample meeting note with my system, I hope it gives you a better idea of how I use it. What is your system? Please share! Example of how my symbol system for note taking works. See a trend here? If sometimes it feels like email is running your day, then you are not alone. The BBC reported that one third of office workers suffer from email stress, which I find interesting because email doesn’t really cause stress. It is how you deal with it that is the root cause. On a previous post, I discussed some productivity boosters for those trying to manage the daily flood of emails, and this amusing chart (below) from HR Management reminded me of the constant struggle we all have when it comes to increasing our productivity while keeping our stress level low. If your office is anything like mine, your colleagues send you Youtube videos, web links, and other stuff that although very entertaining doesn’t help you get your projects done on time. Have you ever tried simply not checking email? The chart above shows in a funny way that you sometimes feel more productive when you are checking email, and that you may turn to it if you get bored, and from personal experience I have felt the same way. Think back to your daily activities. When are you usually checking email? Is it the first thing you do in the morning? Right after lunch before you decide to finally tackle that week-old project? Are you using email to get your adrenaline up like a junkie? Just close, shut down, disconnect and ignore your email for about 1 hour. If you are feeling extremely brave, then try going for 2 straight hours. That’s right, and no peaking! Ignore the email and focus on work. I bet you can get some stuff done today. What is your stress level today? Close the email and ask yourself again in 1 hour. Note: the tips I give below work in MS Outlook 2003 as well as 2007 version. Outlook 2007 has even more features for helping you categorize stuff, but we’ll keep it simple for now and focus on the features available in both versions. An Effective Marketer gets things done. He is known for his ability to complete tasks, get campaigns back on track, measure and make course corrections in a timely fashion and still handle responsibilities that are not even in his job description. How does he do it? With focus and by tackling one thing at a time. If we could just create our plans for the year and stick to them without having any additional requests or emergencies come up after that, life would be perfect. But no! Stuff keeps happening. Meetings here, there and everywhere taking up precious time, emails that keep coming, voice mails that keep getting through, and those pesky employees that just can’t function without direction. Life could be good, indeed, if you lived in an island alone. But since you’re reading this, odds are the life in an isolated island is out of your reach. So let’s at least try to get some stuff done, shall we? Concentration is the main thing, as Peter Drucker said, but in order to focus you need to know what to focus on. Should you check out that email from the CEO that just came in and stop revising the ad copy? Or should you get to the action items discussed during the last staff meeting? Aha! So many things taking your time and attention that you can’t focus, huh? The answer is to first get organized. There are several methods of organization being one of the most popular with technology folks the GTD (Getting Things Done) system. But whether you subscribe to GTD, to Autofocus, ZTD, Covey’s 7 Habits, or any other system you need to have a way of organizing and creating action items/tasks. That’s the core of getting stuff done and being productive. Some people like paper and pencil and carry notebooks around with them, pages filled with meeting notes, reminders, etc. Others use PDA’s , their iPhone, or a computer. What most don’t realize is that they probably already have a pretty good tool for helping them organize their tasks, prioritize, and take action. That’s MS Outlook, used in most corporate settings to handle email but not fully understood from a task management perspective. First time I tried to use Outlook for more than email and calendar, I really didn’t like it. But I also had no idea of how to use it properly, I was just creating tasks and forgetting to check back on them and spent more time looking for a particular task than actually doing work. Well, those days are over because I realized that if you want to use Outlook for task management, it can actually be very effective. You can even incorporate GTD characteristics to make it more functional. A light bulb went on in my head when I read Getting Things Done and he talked about creating a tickler folder and different categories for stuff. Common sense, obviously, but it just helped me see my workload in a different way. website related stuff, and so on. This helps me because I can either check on all “Action” tasks and then check on all “website” related tasks and prioritize. The default task categories in Outlook are OK but you need to create your own set of categories. When you create a new task, click on the ‘categories’ button at the bottom of the new task screen and then click on the “Master Category List” button. You will now see the ‘master’ list and will be able to edit, add, or delete categories. OK, now that you have categories you will be able to get all stuff you need to work or get done assigned to a category, or even multiple categories. Let’s say I need to review the copy for a new spec sheet. I will assign this task as “Action” (because is something I need to work on) and also assign it to “Collateral” (because is related to collateral materials). I like this ability to multi-tag or assign multiple categories to tasks, it can come really handy. a task is under “Website”, you don’t know whether is something that requires you to work on, to follow-up on, etc. but if a task is under “Follow-up” then the goal is clear. And you want these action-oriented categories to appear first on your Task Manager screen. Simply edit the category name and start it with an @ symbol. This will make it come first when you sort your tasks by categories (which you should always do). This way you have displayed first the action items in their respective categories. After leaving voice mails for another manager for a week, he finally calls me back to see what I needed and I only have 10 minutes before he jumps on another call, and I have to scramble to go through the emails I sent him or look back at some notes I took to get the list of things we needed to discuss. And usually I forget one or two items. By creating the “@Follow-Up” task category I was then able to add tasks to follow up with that manager on a number of different items and be more prepared for when I finally was able to catch up with him, but still that required to browse through a list that contained not only follow-ups with him but with other people as well. That’s when I started creating VDP lists (for “very difficult people” to get a hold off). These are categories that have that person’s name, like “Jonn’s List” or “Mary’s Lists”, etc. When there’s an action item that requires me to check with them or follow-up with them, I can add that task to that person’s specific list and when I am finally able to get a hold off them, I open that category in Outlook and go through the task items. Instead of the VDP list, you can also create one for different projects (Tasks associated with Project ABC that need to be discussed during the status meeting every other week) or for a specific meeting that’s held every month. Let’s say you have a staff meeting or a management meeting where managers of all departments get together to discuss several items. Well, as you wait for the next month’s meeting, you can start allocating items in task manager for that specific category, let’s say “Monthly Management Meetings”. Now, before GTD zealots and the like start picking this idea apart, remember that sometimes the action you need to take is simply “bring up idea about xyz during next management meeting”. So if you can capture that item and properly categorize it, you will be ready when time comes. Where some of the productivity systems fall apart is on the prioritization part. Simple to-do lists fail because you never seem to be able to get through all those items on the list, in fact at the end of the day the list has grown even more! And for all good that GTD, Covey, and other systems give you they never get into too much detail about how do you decide what you should do first. Yes, that’s where YOU have to start making decisions based on your goals, your availability, your resources, and on what’s important to you. Deciding what’s important and what’s urgent (as Covey likes to put it) is a critical thing if you want to become effective, but is also subject for another post. Let’s just assume for now that you know what needs to be higher and lower priority, so you need to get your tasks in Outlook to reflect that. So either you do this each time you create a task or when you stop to evaluate your time and open each task and assign it a priority. Outlook gives you “low”, “medium” and “high”. Now you not only have tasks associated with different action-items (follow up, call, etc.) but you have prioritized them. Go to “View” menu, select “Arrange by”, “Current View”, select “Customize Current View”. Make sure that “Group by” is “Categories (ascending)” and in the “Sort by” click and select it to be “Priority (descending)”. This way your Task Manager view in Outlook will show all tasks grouped by categories with higher priority tasks showing first within the categories. If you need another yet another layer of prioritization, you can also create a category called “@@This Week” (the @@ signs will guarantee it will show up on top as the first category, make sure to configure the “view” to group by categories though) and as you go through your task list on a Friday afternoon or before you start work on Monday, you can look at the high priority tasks in each category and also assign it to the “@@This Week” category. When you’re done with one task you can simply go back to MS Outlook Task Manager, look at the next task listed under your This Week category and get it done. As I explained in a previous post, you can simply drag email messages to your Task Manager icon in Outlook (works for Outlook 2003 and 2007) and that email will become a new Task Item. Easy, simple, and efficient! Also don’t forget the killer CTRL+SHIFT+K keyboard combination that will create a new task item wherever you are in Outlook. As you get emails, make sure you process them and if there’s an action that needs to be taken, use the proper categories and prioritization. If you want to know more about processing emails, getting your inbox empty, and working more productively you should definitely check out 43Folders and their “inbox zero” series of articles and a great Primer on the GTD system is the blog post at 7Productions. Next: Is your calendar working for or against you? 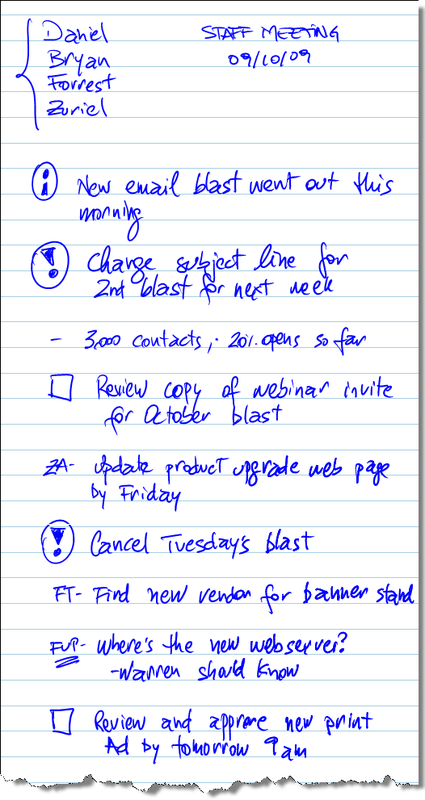 Some simple tips for MS Outlook Calendar that will help you become more productive.